Naksh returns to Singhania family. He has come back after six months. He is sorrowful to lose Akshara. 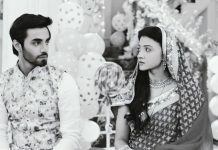 He has come at the time of Naira and Kartik’s marriage. Naksh unhappily accepts the shocking reality that Akshara is no more. Singhanias do not know about Kartik’s truth. Kartik tells Singhanias that he will keep Naira in the new flat, and not with Goenka family. This upsets Kartik’s Dadi. 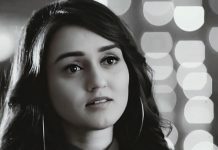 Dadi blames Naira for breaking Kartik from them. 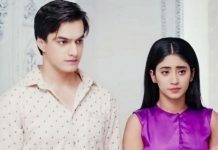 Kartik tells Naira about the truth that he has left home many years ago, and now he has realized that he can’t stay with Goenka family. He says I have seen them lying to me again, I know Naira will be happy with family, but I don’t want to keep terms with Goenkas. Dadi comes there to talk to him. He tells Dadi that he does not want to keep relations with Manish and Suwarna. Akshara is not with the family. Everyone miss Akshara, as she always solves the problems in relations and families. Naira hugs Akshara’s picture and cries. Naira will happy everything now. The family is very happy with Naksh’s return. Singhania family gets happiness. Naksh went for trekking adventures and did not know about Akshara’s death. Naksh promises Naitik to do all duties of a responsible son. Will Naksh and Naira be able to cope up with Akshara’s loss? Keep reading.